Why Is My AC Unit Blowing Warm Air? When the weather begins to warm, the last thing you want is to have your AC unit blowing warm air. So why does this happen, and what can you do about it? Andersen Heating & Cooling has the answers. The first thing you should check if your AC isn’t working is your thermostat. It’s easier than you might think to forget to switch functions once the seasons change, but often homeowners don’t remember to change the setting from HEAT to COOL! Make sure your thermostat settings are correct this spring. While you’re at the thermostat, check the fan setting. If the fan is set to ON, it will run continuously and blow warm air when the AC unit is cycled off. Set your fan to AUTO this spring in Charlotte. Clogged air filters are your air conditioner’s worst enemy. 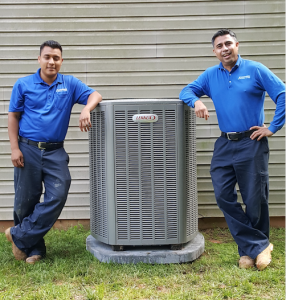 They can cause higher energy bills, which makes your air conditioner work harder, and even cause premature system failure. To avoid your AC unit blowing warm air, change your filter at least once a month. This will also help ease your allergy symptoms and lower energy bills. Air conditioners need refrigerant in order to force warm air out of the home. If your refrigerant is leaking, your AC unit won’t be able to cool your home properly. Call Andersen Heating & Cooling for your refrigerant leak repair and recharge today! Over the years, your ductwork will inevitably undergo some wear and tear. This can create holes and cracks in the duct system that allow the cool air to escape. In turn, warm air from the attic or crawlspace can enter the ducts and blow into your home. Call Andersen Heating & Cooling or click here to schedule your HVAC ductwork repair today!